For a long time I’ve been fascinated with Japanese papers, and have done a couple of tests to see if I could get a satisfactory inkjet image printed on them. So far I haven’t had much luck, but I’ve just picked up a sample pack of ten coated papers from Hiromi Paper. I’ve run them through the Epson 2400 using Bowhaus’ Ink Jet Control software RIP. I particularly like the Niyodo Kozo and Niyodo Natural. 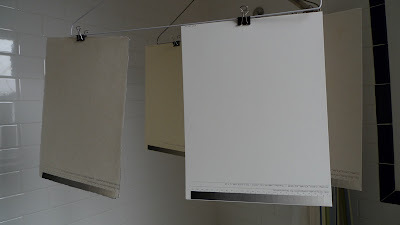 I’ve also tested a sheet of Kozo Gampi Torinoko, which is very nice but expensive at $5.25 for a single 8.5×11 sheet. Excuse the photo of my bathroom… I dry prints in there as it is the most dust free area of my apartment!